Winner of the 2015 MSRI Mathical Books for Kids from Tots to Teens Award! This is a lovely book — playful, colorful, and inspiring in a really big number of ways! Richard Schwartz doesn't simply "explain" — he guides us through a marvelous and vibrant playground of numbers; "us" being anyone between the ages of 4 and 444! —Günter M. Ziegler, Freie Universität Berlin, author of "Do I Count? Stories from Mathematics"
A superb, beautifully illustrated book for kids — and those of us still children at heart — that takes you up (and up, and up, and up, and up, and ...) through the counting numbers, illustrating the power of the different notations mathematicians have invented to talk about VERY BIG NUMBERS. Many of us use words to try to describe the beauty and the power of mathematics. Schwartz does it with captivating, full-color drawings. —Keith Devlin, NPR Math Guy and author of "The Math Instinct" and "The Math Gene"
Large numbers may seem like a banal subject, but Richard Evan Schwartz goes way, way beyond the banal, presenting the concept of big numbers with a freshness and originality rarely seen elsewhere. Using beautiful and imaginative illustrations to build from single digit numbers to sextillions, googols and beyond, his evocative drawings will give the readers, not only children, a true feeling for the vastness of numbers, nearly to infinity. I am anxiously waiting for my granddaughter to become old enough, just so I can give her this book. —George Szpiro, Neue Zürcher Zeitung (Switzerland) and author of "Secret Life of Numbers" and "Mathematical Medley"
In the American Mathematical Society's first-ever book for kids (and kids at heart), mathematician and author Richard Evan Schwartz leads math lovers of all ages on an innovative and strikingly illustrated journey through the infinite number system. 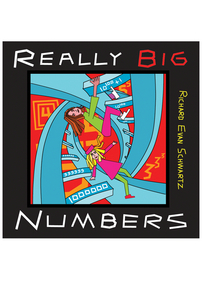 By means of engaging, imaginative visuals and endearing narration, Schwartz manages the monumental task of presenting the complex concept of Big Numbers in fresh and relatable ways. The book begins with small, easily observable numbers before building up to truly gigantic ones, like a nonillion, a tredecillion, a googol, and even ones too huge for names! Any person, regardless of age, can benefit from reading this book. Readers will find themselves returning to its pages for a very long time, perpetually learning from and growing with the narrative as their knowledge deepens. Really Big Numbers is a wonderful enrichment for any math education program and is enthusiastically recommended to every teacher, parent and grandparent, student, child, or other individual interested in exploring the vast universe of numbers. Appropriate for ages 6 and up, their parents and teachers, and anyone curious about Big Numbers. By means of engaging, imaginative visuals and endearing narration, Schwartz manages the monumental task of presenting the complex concept of this book in fresh and relatable ways ... This book is a wonderful enrichment for any math education program and is enthusiastically recommended to every teacher, parent and grandparent, student, child, or other individual interested in exploring the vast universe of numbers. This book is a masterpiece. Starting with small, easily observable numbers and building up gradually to the dizzyingly huge ones towards infinity itself, the author takes readers on a fascinating journey of discovery, making increasingly complex concepts accessible through a combination of striking illustrations and passionate, enthused writing. Schwartz does a very nice job of mixing very elementary ideas with mathematical content that will be new even to mathematicians, making for a fun and enlightening reading experience. ... [A] written review such as this cannot capture the spirit of Schwartz's book, every page of which is illustrated with bright colors and beautiful drawings that are appealing to look at even beyond the mathematics that they convey. This book is a chance to learn something new about the really big numbers. But it is also a chance to experience the awe, the mystery and the playfulness of math with your child and as a child. This is a classic book to which I can imagine a child returning again and again as s/he grows older, getting more out of it each time. The book gets better with every reading. ... It is great for sharing, and for explaining why we like mathematics so much. Get it with someone small you love, and start a journey. ... This book would clearly make a great present for mathematicians to give to their children.